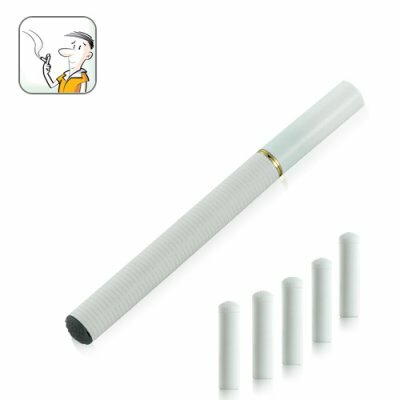 Successfully Added Ladies Electronic Cigarette to your Shopping Cart. Ladies e-cigarette for a healthier alternative to regular cigarette smoking. It works because it gives women smokers the nicotine they crave, but doesn't contain the hazardous tar found in normal cigarettes! What's an electronic cigarette? It's great way to decrease the negative effects of smoking or if you want to quit smoking - it can help you do that too! How does it work? This Ladies Electronic Cigarette is made up of two parts. A liquid nicotine cartridge and an atomizing unit with built-in battery. When you inhale, the atomizing unit vaporizes the liquid nicotine and delivers it as deliciously yummy smoke to your lips. The result - real smoking experience, real smoking flavor, real smoking enjoyment. Each pack comes with two atomizing units and 5 liquid nicotine cartridges. Each cartridge is the smoking equivalent of 18-30 cigarettes. A fully charged electronic cigarette will power several cartridges. When power levels are low, simply plug the e cigarette into the charger for two hours. It's that simple! This amazing healthy smoking alternative is in stock now and ready for immediate shipment. Brought to you by the leaders in online direct from China wholesale electronics - Chinavasion. On the question about whether you could smoke e cigarettes on airplanes or trains, probably not. The fact is, they look real and produce vapors which look like smoke, so people will inevitably think they're real cigarettes.